Rising motorsport star, Alexandra Whitley. There’s a lot more to Alexandra Whitley than her winning smile but her gleaming white teeth could hold the key to securing her the sponsorship she needs to take her career to the next level. After a season beset with mechanical failures she was placed 11th overall in the SsangYong Actyon Ute Racing Championship Series which ended at Pukekohe Park in April. Reaching speeds of up to 170kph in a double cab 2.7l petrol ute, Alexandra proved she was on track to achieve her ambition. Offered the opportunity to race in Europe, Alexandra now needs to find sponsorship to make that happen. And, that’s where her winning smile comes in. Australian Alexandra grew up in a racing family in Toowoomba with her father a keen speedway driver and her older brother and sister both motor racing enthusiasts. She was a relatively late starter to motor racing first getting behind the wheel at 17 years old. Alexandra moved to New Zealand two years ago to follow her dream and was awarded a Junior Development Scholarship by the Women of Australian Motor Sport (WAMS). More recently she was one of few selected to attend the New Zealand Elite Motorsport Academy in Otago where she learnt about dealing with the media, fitness, nutrition, mental and physical training and establishing sponsorship. Her fiancé and fellow Australian, Peter Bennett is also in the SSangYong stable and finished seventh in the series. The couple bought a house in Tuakau six months ago and Alexandra says she loves living close to the Pukekohe track which she regularly cycles round. Although she works for SsangYong in nearby Takanini, even Alexandra’s remarkable driving skills can’t beat the Auckland traffic necessitating a 5am start. After work she goes to the gym for cardio training or back home to work out on her bike. On the other hand, she says a chance to race in Europe would help her career in leaps and bounds. 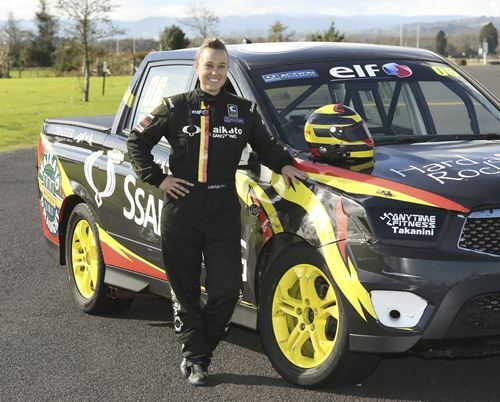 If she doesn’t find sponsorship, Alexandra will continue to race in the SsangYong series which she says is one of the most competitive classes in New Zealand. She’s also looking at moving into TLs, a slower version of V8 Supercars. Alexandra added to her tally of successes at the maiden SsangYong Endurance championship at Pukekohe Park in the first weekend in May. She was the only driver to achieve the podium in both races after completing a gruelling three hours of driving solo. ”Due to a post-race change of rules that saw the last race awarded double points, I finished second overall instead of the overall win,” she said.